Summa summa summatiiiiiime. I’m keeping the oven off for this one. I’m keeping my fruit bowl stocked up on glorious mangoes. And I’m eating them whole, skin off, just me and the pulp, with the juices running down my elbows. When I’m not eating them whole, I’m whipping up the most divine desserts with them, from ice cream to pudding to this luscious mousse. Of course I couldn’t leave well enough alone. Yes, I could’ve blended mango pulp with sugar and folded it into whipped cream. But why do that when adding a bump of flavor is so easy and impactful? I add the juice and zest of half a lime and it works so well to cut the sweetness of the mango and the richness of the cream. It’s a balancing act. And I’ve been obsessed with limes lately. I find the aroma absolutely intoxicating. From virgin mojitos to salad dressings – I’ve been putting them in everything. I also add a splash of vanilla to make it extra special – adding a floral dimension to a fruity dessert. There are two schools of thought when it comes to mousse. One includes raw whipped eggs whites. The other is a more simple one, made with just whipped cream. While this was a delicious, easy and no fuss method of making mango mousse, my curiosity will not be satisfied until I try a version with the egg whites. Though I’m not too crazy about consuming raw eggs, for the sake of recipe testing, I will! So keep an eye out for a future post with the egg white inclusive version! If possible, freeze the bowl and whisk attachment of your stand mixer (or bowl/beaters) for about 10 minutes. Cream whips up much faster when cooler. When ready to whip, take out bowl and whisk/beaters from fridge, pour cream into bowl and add 2 tbsp sugar. Start whipping at low speed. As the cream gets thicker, gradually increase speed. When it reaches soft peaks (when it looks billowy and the whisk leaves lines in the cream), remove about 1 cup of the cream for the topping. Keep mixing the rest until you reach stiff peaks. Add in the vanilla and give it a final stir by hand. Set aside. In a food processor or high power blender, blend the mango puree, 1/2 cup sugar, lime juice and zest until well combined. Gradually add to the whipped cream, 1/3 of the mango puree at a time, folding into the whipped cream gently. When completely incorporated, pour the mousse into a trifle bowl, or similar bowl with high sides. Top with the whipped cream you set aside earlier. Garnish with extra lime zest. I had a hankering for warm, comforting American dishes the other day. Creamy tomato soup. Potato leek soup. Corn chowder. Pan seared scallops. Flat bread dotted with goat cheese and herbs. Just things I wouldn’t usually make since there isn’t a huge appetite for these things in our household. Take exhibit A: potato leek soup. Despite my daughter’s proclamation that she LOVED THIS SOUP and my husband’s accolade, “this soup’s good, Jaan!”, they each had just one serving. Just one. So guess who else had ALL the remaining servings? Yours, truly, of course. When I was a work study (undergraduate doing an on-campus job) at Columbia Business School, I would go down to the cafeteria and scope out what I could afford. Back then, a small soup with crackers cost about $4.75. With tax, it came out to almost $6. Which was a lot for me to fork over for lunch. But a girl’s gotta eat. Neither the $3.50 muffin nor the $12 sandwiches weren’t good alternatives. I looked at a bunch of different recipes before diving into this. I knew I wanted to caramelize the leeks a bit. I knew I didn’t have chicken stock on hand, and not even the full amount of vegetable stock needed for this amount. I knew despite all the different herbs I read people used, I wanted to use dry thyme (one of my favorite pantry items since it adds such a lovely aroma and flavor and I could sense my kids associating its scent with my cooking), and rosemary. Finally, I knew I didn’t want to have a big huge batch because something told me I’d be eating 90% of it. So I halved the amounts I read in other recipes, I sautéed the veggies a bit longer, and I used a combo of vegetable stock and water. Depending on the type of vegetable stock you use, your color will vary. Mine was the low sodium one from Trader Joe’s. Made from carrots, tomatoes, among other vegetables. Thus imparting an orange hue to a normally off-white soup. The type of vegetable stock you use will also affect the seasoning required, so make sure to add just enough salt and pepper until it’s really really tasty. I didn’t put rosemary in the soup directly. I thought the presentation and flavor would be more pronounced with an infused oil added at the very end. Take that, winter. Slice ends off of leeks and slice down the middle lengthwise. Rinse well to get rid of the dirt in between all the layers. Thinly slice into about 1/4 strips. Heat oil in a large pot (stainless steel or enameled both work) over medium high heat. Add leeks and dried thyme. Sauté until leeks are softened (6 to 8 minutes). Add the potatoes, salt and pepper. Stir to coat all the vegetables in the seasonings. Add stock, water and bay leaf and bring to a boil. Lower the heat, put the lid on and cook for about 20 minutes, until potatoes are tender. Once the potatoes are tender, turn off heat and remove the bay leaf. Purée the mixture with an immersion blender, or in batches in a blender. Put the pot with the puree back on medium heat. Add the cream and creme fraiche if using. Stir. When mixture comes to a boil, stir and taste for seasoning. Add more seasoning as required and remove from heat. Make the rosemary garlic oil: in a small saucepan, combine olive oil, garlic clove (smashed with the palm of your hand or side of a knife) and rosemary. Cook over low heat, allowing the garlic and rosemary to gently infuse the oil. Remove from heat when fragrant, about 5 minutes. Ladle the soup in a shallow bowl. Drizzle with a bit of oil and a dollop of more creme fraiche, if desired. *Can use chicken stock. Can nix the water and use all stock instead. One and half cups was how much I had on hand, so that’s what I used. I invited my childhood friend, Aileen Olmedo of TheStyleBoro, over for breakfast this past weekend. Her blog is a fun destination for the unequivocally stylish and youthful city dweller. Youthfulness is a state of mind folks, not a number. Rather than prepare traditional brunch items she could enjoy at a number of NYC spots (e.g. eggs benedict, waffles, french toast) I thought I’d make her a spread reminiscent of my beloved babymoon in Istanbul. BTW, Zeynep if you are reading this please don’t hate me if I butchered an authentic Turkish dish. I know you’re supposed to use Turkish peppers, not jalapeno or Chinese peppers. I know you’re supposed to use onion not scallion. And any other changes I made, I only made to make this wonderful breakfast dish a bit more accessible to the average American home cook! I love how the colors pop in a Turkish breakfast spread. White cheese, green cucumbers, red tomatoes, rich Soujuk (Turkish sausage), black olives, fresh squeezed orange juice. Makes for a dramatic presentation. If you can find apple tea and borek (cheese or meat pastry), those are also wonderful additions. Even if you aren’t looking for an all out breakfast extravaganza, you can enjoy the recipe below for Menemen – eggs scrambled with peppers, tomato and onion until they are just barely set. A wonderful change up from your usual eggs and toast breakfast. Heat oil in a large non-stick skillet or wok over medium high heat. Add scallions, tomato, pepper and cook 4-5 minutes, until soft. Add cayenne, paprika and salt and cook for until tomatoes break down and onions get super soft, another 2-3 minutes. While the veggies cook, crack eggs into a bowl. Season with a pinch each of salt and pepper and whisk with a fork. Whisk well – until the eggs look like a uniform yellow mixture. Pour into skillet and lower the heat to low. Cook, stirring occasionally, until the eggs just start to set. Turn off the heat and add the parsley. Give it a final stir and serve with warm bread. Anyone else find themselves questioning their life choices? First world problems, right? I’ve got a roof over my head, food to eat, a wonderful family – so much to be grateful for. But I’m feeling sorry for myself because I haven’t “made it” yet or didn’t pursue one of the more conventional paths of engineering, medicine, or law (not that I have a litigating bone in my body). Of course this comes at a time when most of my high school and college classmates are receiving their secondary degrees and the grass is looking greener on the other side. But I’ve been trying to embody the saying I’ve read recently, “The grass is greener where you water it”. I love my family and would be so empty without them. But I need to reach my professional goals as well. Would love to grow this blog or my little side hustle (custom cakes) but I feel like I’m lacking some guidance. Is it my content? My outreach? Help me out, guys!! Granted I have two little ones, one who is isn’t in school yet, so my resources are limited. Speaking of little ones, for years I lamented that despite my efforts to make mac and cheese from scratch, my kids preferred the stuff from the blue box. Relieved, since dinner could be ready in a snap if I had the blue box on hand. Affronted, as well. So I sought a solution. The problem was the traditional mac and cheese recipes I followed were quite cheesy. Resulting in a strongly flavored and thick sauce. So, I thought I’d make a bechamel sauce, add in a little bit of cheese at a time until it had just enough thickness and was mildly flavored enough for my kiddos, and voila! I made something that my 3 1/2 year old would lick clean off the plate. This comes together so quickly, you’ll be like, blue box, who? Granted you have pre-shredded cheese. I use the Trader Joe’s blend of mozzarella, cheddar and jack cheese. It’s wonderful in omelettes, grilled cheese, etc. Throw in some frozen peas with the pasta during the last minute of cooking to make it a complete meal. Or shredded beef/chicken. The sky’s the limit. I just keep the chicken broth on hand in case it gets too thick. Make this once and you’ll never go back to Panera’s mac and cheese! Feel free to double the recipe if you have more mouths to feed! In a medium to large pot, heat about 4 quarts of water over high heat. Let it come to a boil while you prepare the other ingredients. When it comes to a boil, add a teaspoon of salt and the pasta to the water. Give it a stir and set the timer to 8 minutes (check the time on the box for shells since I used elbows). Melt the butter over medium heat. Add the flour and whisk together. Allow to cook for 1-2 minutes. Next, slowly pour in the milk, while whisking. Continue whisking, taking care to get all the bits of flour and butter from the bottom of the pan. Lower the heat to a simmer a let cook for 5 minutes. It won’t thicken fully at this point. Make sure the mixture is not boiling otherwise the cheese will curdle*. Turn off the heat (and the heat of the pasta if the timer is up). Add salt and pepper and stir to combine. 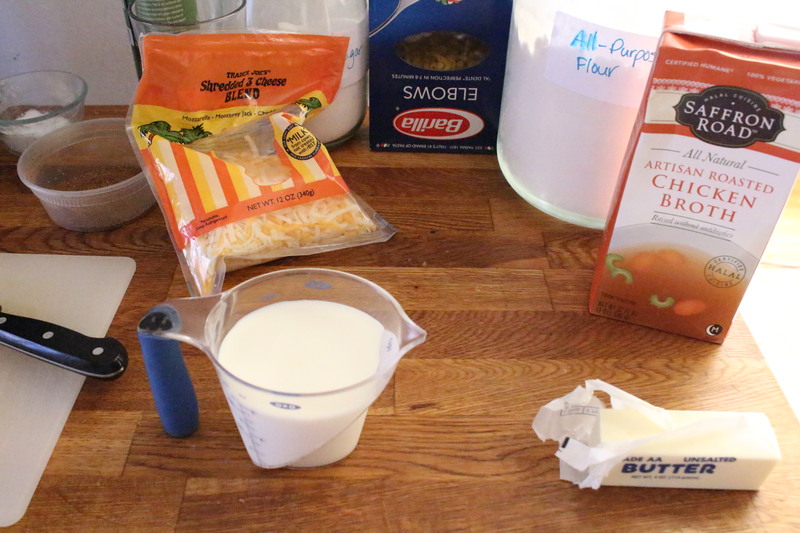 ** Add cheese and stir – now the sauce should be sufficiently thick to coat the pasta. *I learned this the hard way after ruining two batches during our suite’s Thanksgiving potluck in college. **Congratulations, you’ve just made bechamel sauce! ***To reheat, add a bit of chicken broth to a saucepan and warm over medium low heat until heated through.